The Wrigley Building is located at 400 N. Michigan Ave, Chicago. The city's tallest when completed in 1922. The 18 story North building was added in 1924. This building was designed by Graham, Anderson, Probst & White and stands 438 feet tall with 27 floors. 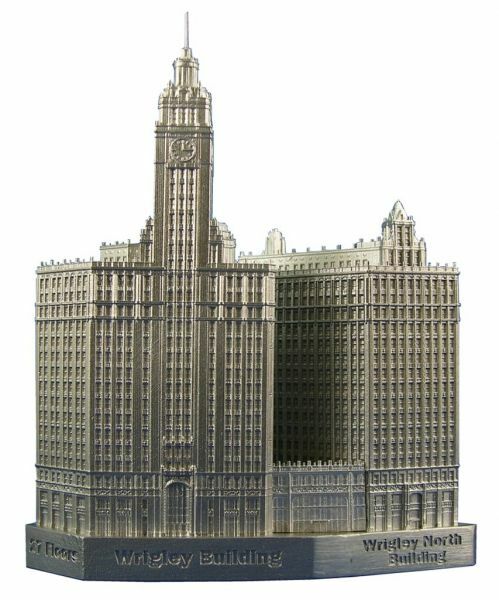 This replica building stands 5-1/4 inches tall, it is finished in new pewter. This is more than a model but a work of art that can be held in your hand. I recommend this for the serious collector; especially for those into Chicago pieces. A fantastic building and the replica captures that. Had mine finished in white because the real thing is white terra cotta. Came out just as I had hoped for. Only one word to describe this building replica: SUPERB!